Town Square of St. Mihiel, France, 1918. Photo: Schutz Group Photographers. Library of Congress, Prints and Photographs Division: Call Number LOT 6944 no. 15 (OSE); 6a35216u. We have been having a few cold days and it seems good after the terribly hot weather we had. Your dad’s and Uncle Lon’s buckwheat looks fine. Uncle Lon gathered wheat last week. He has a yearling that he is going to put into beef this fall, so with our wheat and buckwheat, meat and vegetables, and fruit that I am putting up, our living won’t cost so very much…I am going to put up some plums and crab apples this week. The only thing lacking is the chickens…I think you will find a fine flock of chickens on the place when you get back. I’m not sure how long it took Aida’s letter to arrive in France, but by the end of August there are some big changes underway that will affect McKinley and all the Austins. On August 30, 1918, the first American Army under Gen. Pershing’s own command, took over the entire St. Mihiel Front with four Army Corps assembling the 1st, 4th, and 5th American and the 2nd French Colonial Corps. On that day, Marshal Fock…proposed two new jobs for the American Army. The first was to be an attack between the Meuse and the Argonne Forest, on September 15th by the 2nd French Army supported by from 4 to 6 American Divisions. At a meeting 3 days later, General Pershing insisted that the American Army be employed as a unit, and not piecemealed out…Pershing asked for the Muese-Argonne Sector. Fifty kilometers of the front from the Argonne to Port sur-Seille well to the east of St. Mihiel was placed under Pershing’s command together with all the French divisions then in that zone.—Gen. Liggett, from Saturday Evening Post, June 4, 1927. Col. George S. Patton Jr.
General Pershing had earlier ordered the creation of a tank force to support A.E.F.’s infantry. In August 1918 Colonel George S. Patton Jr. (who was involved with training tank brigades) was placed in charge of the 1st Provisional Tank Brigade (later called 304th). Patton would command the French Renault tanks driven by Americans at the St. Mihiel Offensive.—From wikipedia.org. Our boys in France learning to correctly use gas masks. Photo: Library of Congress: Keystone View Company, LC-USZ62-92733. Both Irwin Briggs and Cyrus Roullion (and probably many of the others in this story) experienced Gas Warfare. Until the first world war, it was considered uncivilized to use poison gas. The French fired tear-gas grenades against the Germans in August 1914, the first month of the war. Two months later, the German army fired chemical irritants or tear gas. Chlorine gas was used by the Germans in April 1915. Phosgene gas (with a delayed affect of up to 48 hours after inhalation) was used by both German and Allied armies. The Germans used mustard gas against the Russians in September 1917. Mustard gas was also used by the Allies. An almost odorless chemical, it caused internal and external blisters several hours after exposure; could burn lungs and cause blindness, and severe burns; and stayed in the soil for weeks after release. Gas protection first included cotton pads dipped in a solution of bicarbonate of soda held over the face. By 1918 when the use of poison gas was widespread, filter respirators were available. Mustard gas caused the most gas casualties on the Western Front. Both chlorine or mustard gas could cause blindness. Respiratory disease was another common affliction caused by the gas attack. 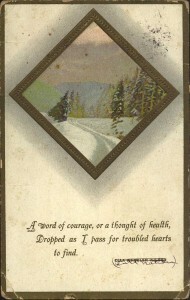 Some died from tuberculosis.—wikipedia.org. 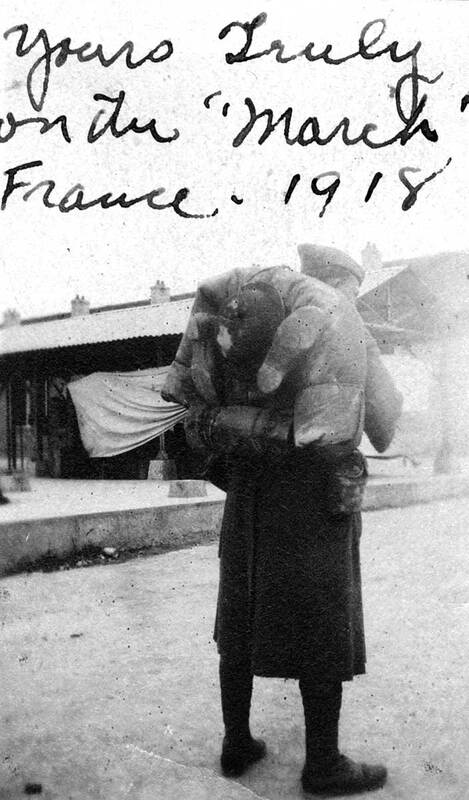 Irwin Briggs on the March in France, 1918. Photo courtesy of MA. I hope you will pardon me for not writing sooner. But when I had paper, I did not have time and when I had time, I could not get paper. Have you heard from Raymond lately? I have had one letter from him. I don’t suppose there are so many city boarders up this year. Aunt Aida sent me a couple of pictures of the children saluting. They certainly looked comical, especially Robbie. Is Willie still working at Proctor’s? Tell Grandfather that I will write him sometime. When I get back home, we will have some time swapping war stories. Raymond will talk for a week steady when he gets back. The letter I commenced to you the forepart of last week, I did not get finished until the last of the week, but as I have planned to send you a letter every Monday, I will write you a few lines tonight so as to send it off in the morning. Fred Morgan is home for a few days. 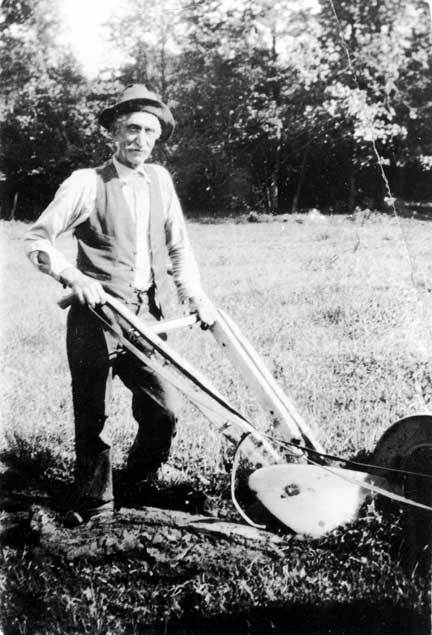 I have not seen him…George Sidwell is at one of the camps in one of the southern states. He is attending some kind of a school. His father was telling your dad that at Panama they wanted George to drill for an officer, but George didn’t want to be an officer. It is quite comical to hear about the different fellows from this place being officers. The Congregational Church had their fair last Thursday and Friday and took in a little over $300 the first day. We have been having some fearfully hot weather, but it is cooler now again. I hope you haven’t had such hot weather over there. 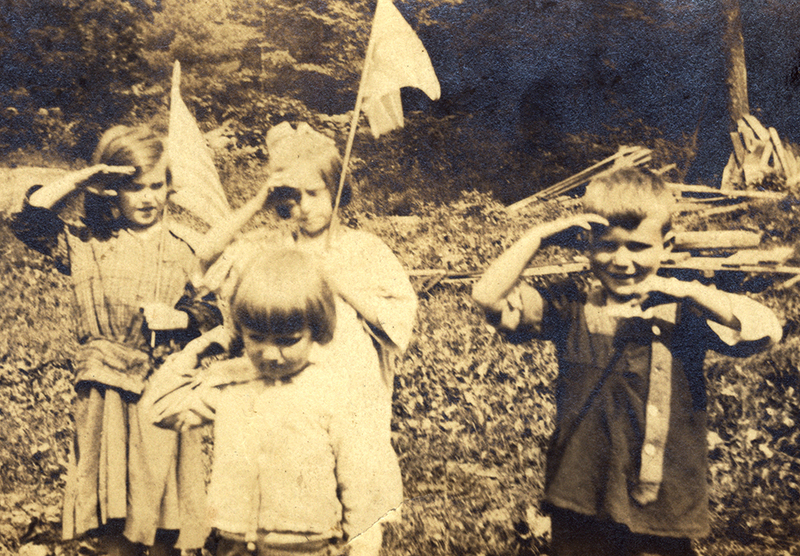 “Aunt Aida sent me a couple of pictures of the children saluting. They certainly looked comical, especially Robbie.” On left: a friend, Elizabeth, Bob (Robbie) and Art Austin. 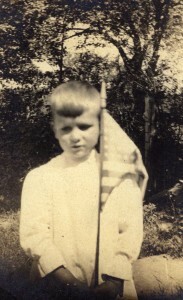 McKinley’s brother Art Austin holding a flag. I got your letters all right. And I got one from Raymond at Camp Merritt. It must be hard for you to see us go, but you have been very brave. If all the mothers in America were like you, there would not have been a need for a draft. I think the reason we boys, who are no braver than the average, were so quick to go, was that we have always been taught that we have a duty to our country. Some seem to think that their country should protect them, but shouldn’t call on them to help. By July 14, 1918, the 11th Infantry was at Saint Dié, France, near the Vosges Mountains, at least 400 kilometers (249 miles) east and a bit south of Paris. On July 18, 1918, General John J. (Black Jack) Pershing led the American Expeditionary Force at the Battle of Château-Thierry, northeast of Paris. 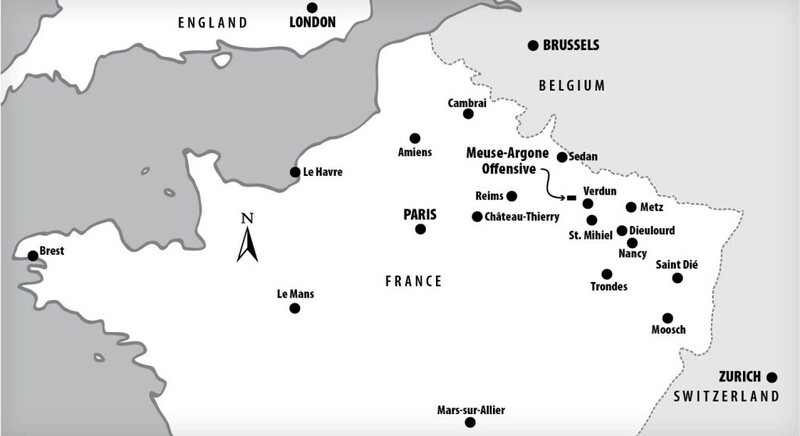 In July the Allied commanders agreed on a strategic offensive plan which included an attack at St. Mihiel, France. The 11th Infantry would be part of this operation which was to start on September 12. I have been so busy, or so lazy that I have not written lately. But I thought you might worry. I got the pictures all right. They were good. You wanted to know about this country. There are some of the prettiest places here I have ever seen, but I prefer Sullivan County. I have seen pictures home that look just like the country here. My grandfather Irwin Briggs on the March in France, 1918. When Raymond Austin enlisted in May, Mort and Jennie Austin had two sons to be concerned about. 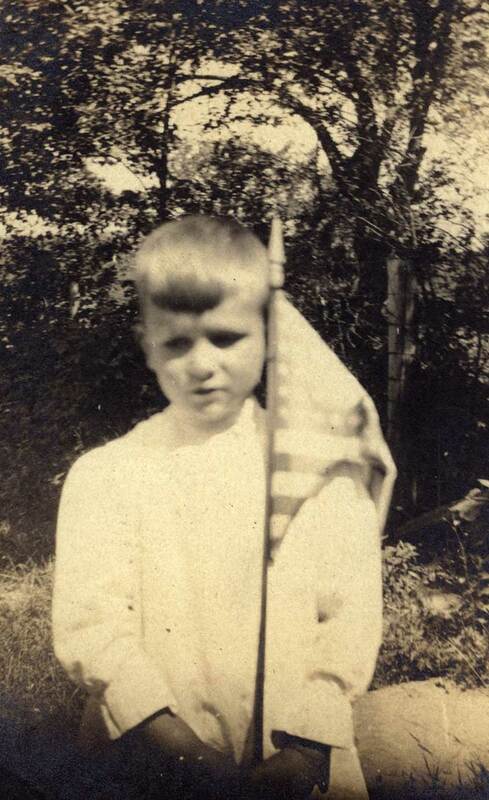 In mid-June, Raymond was recuperating at the Base Hospital at Camp Merritt, NJ. McKinley was with the 11th Infantry in the Vosges Mountains, France. From mid-June to mid-July, the 11th Infantry Mortimer McKinley Austin was with, worked their way from Moosch, Alsace, in the Vosges Mountains to the Saint Dié Sector—66 kilometers (41 miles) west. McKinley was in the Machine Gun Company. His outfit took part in the Vosges Mountains, St. Mihiel, and Meuse-Argonne offensives in northeastern France. Germany had built a major defensive fortification system in northeastern France. Known as the Hindenburg Line, it included concrete bunkers, heavy belts of barbed wire, tunnels for moving troops, deep trenches, dug-outs, command posts, and machine gun emplacements—excellent protection for German machine gunners.—From wikipedia.org. Early on the morning of June 26, the Germans attempted to raid the positions held by Companies I and L. The raid was repulsed with losses to the enemy.—Sergeant John G. Popp, 11th Infantry History. Just a few lines to let you know I am all right. I have been to the trenches and like them better than drilling. It was bad when it rained, but on good days, I like it. The Germans shelled us once or twice but the more I see of artillery bombardment, the less I am afraid of it. Did Raymond ever join? I think it will do him good. I wish you would send me the address of the Eldred boys who are in the Army. Ad in the Republican Watchman, June 1918. Highland Cottage owned by Edith Kalbfus in 1917. 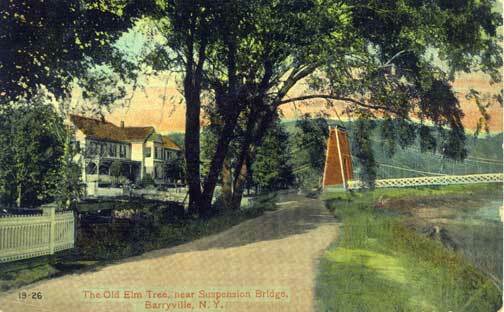 Postcard courtesy of Town of Highland. 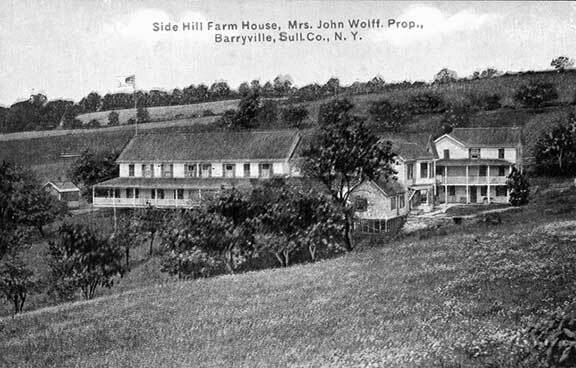 Side Hill Farm House owned by Henri Darrieusecq in1918. Postcard courtesy of Town of Highland. Splendidly situated on Washington Lake. Accommodates 125; fine roads, dancing, bathing fishing, tennis, garage; $12 to $14. E.V. Kalbfus.—Brooklyn Daily Eagle, June 25, 1918. Own farm produce; $12 to $14 per week. Henri Darrieusecq, Proprietor, Barryville.—Brooklyn Daily Eagle, June 25, 1918. Two 6-room cottages on easy terms; also Washington Beach Hotel; bathing beach and dance hall; all part furnished. 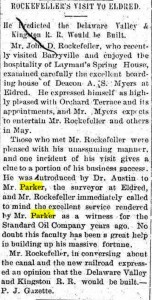 For full details write W. T. Tether, owner.—Brooklyn Daily Eagle, May 25, 1918. Accommodates 30; cuisine Francaise. Bathing, fishing, and boats free; $12 up. H. Bodine.—Brooklyn Daily Eagle, June 25, 1918. Accommodates 75. Boating, bathing, fishing; own farm produce. J. Loerch Stewart, Highland Lake.—Brooklyn Daily Eagle, June 25, 1918. Large airy rooms; excellent table; everything fresh from our farm. Circular. E.D. 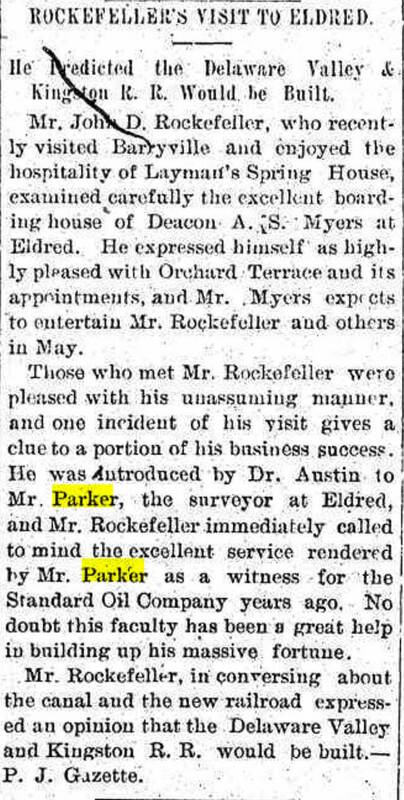 Avery.—Brooklyn Daily Eagle, June 25, 1918. McKinley’s outfit landed in Brest, France. Château-Thierry, Saint Dié, St. Mihiel, Verdun, Cambrai, Sedan, and the Meuse-Argone are mentioned in Chapter 11. Map: Gary Smith. On April 24, 1918, McKinley Austin (11th Infantry) left Hoboken, New Jersey, on the U.S.S. Leviathan. They arrived on May 2, in Brest, France. May 8 they arrived at Bar-sur-Aube, southeast of Paris. They were trained there until June first. Six days later, the 11th Infantry moved east to Alsace (German territory at the beginning of the war) in the Vosges Mountains. There the regiment was attached to a French Division. On May 10, 1918, Irwin Briggs left with the advanced party from 89th Infantry Division which was assigned to the IV Corps, American Expeditionary Forces (A.E.F.). He most likely sailed from Camp Upton on Long Island, New York, to England and onto France, where we will next meet him at the St. Mihiel offensive in September in the Medical Corps taking the wounded from the field to the hospitals. Way too many sad good byes would be said to the servicemen from the Town of Highland or those who would one day live in Highland—whether they had volunteered or been inducted. Letters would be anxiously awaited. Some of the Austin letters mentioned several of the town’s soldiers. Walter Toaspern served in the U.S. Army Hospital Corps as a chauffeur; Fridolin (Fred) Straub Jr. served overseas with the U.S. Army, 303rd Engineers, Co. E.
Some families, including the Austins (McKinley and Raymond) had more than one serviceman. Anne Stanton Horton had two sons, John (who fought in France) and Ernest Horton, and a son-in-law, Herman Bosch. 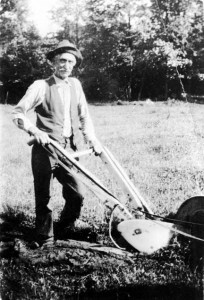 Herman Bosch was the son of Wilhelm Bosch had three sons: Ed, Ralph, and Herman involved in the war effort. Ed Bosch quickly rose to the rank of sergeant. Ed Grotecloss Jr., future husband of Belle Greig, also fought in WWI. Belle was the daughter of Robert and Kate Greig who owned the huge boarding house near Stege’s Pond. Ed Grotecloss Jr., Herman Bosch, Irwin Briggs, and McKinley Austin would all be at the battles of St. Mihiel and the Meuse-Argonne in France, though it is unknown if it was realized in later years.—Echo Hill and Mountain Grove, p. 360. Postcard to Mr. M.M. Austin, Co. F. 11 US Inf., Chattanooga, Tenn., from Burl Nation February 26, 1918, 4 p.m. 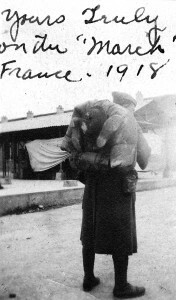 In March, McKinley had a leave to go home before his outfit left for France, as the next letter indicates. Dear father, I got here all right. The train was late into Jersey City and I missed my train. I was 14 hours late, but as I got the conductor to sign a paper telling the reason, I think it will be all O.K. Dear Aunt, I was very glad to get those pictures. They were real good. We are having fine weather here now. I did not send anymore this month because I owed some and there are some things that I want to buy to take across with me. But I expect to have a good deal to send back next month. My corporal is attending sniper’s school and I have had to lead the squad. I don’t like it very much. I am expecting to be transferred to the Machine Gun Company. I would rather stay with F Company, but I have noticed that a good many things that have happened to me lately, really unimportant themselves, have resulted in advantage to me. And while I am not superstitious, I think it best not to try to change that everything is coming for the best. Perhaps you understand what I mean? I suppose I could get another man sent in my place, but I think whatever happens is for the best. William Henry Austin, Aidas father. Photo in the Austin family. In March 1884 Aida Austin was in New York City and received the following letter from her father. 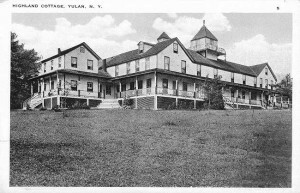 The Stidd Family mentioned was probably William and Mary Hickok Stidd, relatives of Mary Ann Eldred Austin, Aida’s mother. William Hickok, also mentioned, was Mary Stidd’s brother. The Siblings were children of Justus and Mary Wells Hickok. Justus was the brother of Hannah Hickok Eldred, Mary Ann’s mother. W.H. (Henry) Austin, Eldred, to Aida Austin, N.Y.C. Your Mother wants me to write to you to let you know we received your kind letter. We was vary glad you was not detained in Port Jervis for it would have been vary disagreeable for you to have had to wait for the 4 o’clock train after being up all night. I was into Stidds to dinner that day and they was very much pleased with our visit. They talk a great deal about the piece you spoke that night and praised it vary much. I expect we will have to go up to Irv’s some night this week. I wish you could be along to William Hickock’s next week. I think I shall quit surprising folks then. Lon had a letter from Mort Saturday. He has been sick with the mumps, but is getting better. He said Eldred [Ell] would start for Sullivan, Monday, March 10th. Some around here think Mort went some ways to get the mumps. I don’t suppose you care much about politics, but I shall have to tell you how it went in this Town. There was 203 votes polled. Oliver Calkin got 103; T. Gray, 42 votes; C. Frace, 58 votes. Oliver got 3 votes more than both other candidates. So you see, A. Myers don’t run this town yet. Mother says she will wait until Eldred comes home before she sends you the sack and handkerchief. Let’s hear from you soon. Hoping this will find you well as it leaves us.